It’s been a few years since Panasonic unveiled a new digital radio, but their newest model packs up-to-date technology in a small, well designed unit. The Panasonic RF-D20BT comes with FM, DAB and DAB+ reception, which means it’s ready for the future and obtains the digital tick mark. The single speaker is found on the front of the radio below the monochrome display, while the battery compartment and power input are on the rear. Controls for standby, tuning, volume, audio source, Bluetooth, presets and settings are all found on the top of the radio. When switched on for the first time the radio will start in DAB mode and scan for stations. Switching between DAB, FM and Bluetooth is achieved with the source button below the volume knob. You can play streaming music and podcasts through the radio with Bluetooth. Once a connection is established the dedicated Bluetooth button can start and stop playback. Options to change the sound produced by the radio are available with the EQ setting. Five equaliser settings can be chosen from, including Heavy, Soft, Clear, Vocal or Flat. Headphone users will be disappointed with the lack of a 3.5mm output. The compact Panasonic RF-D20BT has a splash-proof design which makes it ideal for kitchen worktops and windowsils. The radio can also be taken outside without worrying about a spray of water ruining the device. However, there isn’t a carry handle and the radio won’t be as durable outdoors as a worksite radio. The splash-proof rating is IPX3, which means the radio should withstand a spray of water up to 60° from vertical. The RF-D20BT is not waterproof and would not withstand submersion in water. Details about the splash proof performance come with the radio and are well worth reading. Battery life is around eight hours in FM/DAB mode and twelve hours in Bluetooth mode with three alkaline LR6/AA batteries. This is reduced significantly with manganese batteries. When the radio is powered by batteries the alarm does not work. The radio comes in black or white. 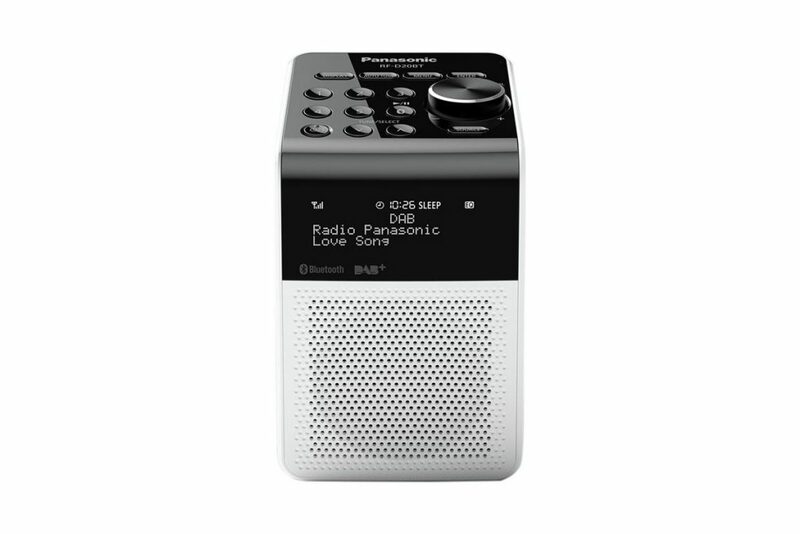 Verdict: Panasonic only make two DAB digital radios and the RF-D20BT is their newest model. Bluetooth connectivity and simple controls make this digital radio a great buy.